The weather is getting cooler, and our official calendar date of autumn is here. It is time for us to take care of our lungs and large intestine. When the weather changes from hot to warm to cool, before it gets really cold, our body adjusts our lungs to breathing in cooler air. Our whole body feels the cooler air and tightens up the lungs. and they are all squeezed out, guess what—our body is trying to detox, and mucus is coming out. You might have a runny nose or sneezing to detoxify nasal mucus, as well as coughing or a sore throat to detoxify phlegm. These recipes are very good when you’ve eaten too much oily and mucus-producing food. Lotus Root tea is especially good to drink when the weather is starting to cool down and you have a sore throat and are starting to cough. Also, it is a good remedy drink for Pneumonia, Asthma, Bronchitis and even Lung cancer. I made it just this morning for Eric and Oro, who have started coughing. I think they feel much better. They love this remedy drink because fresh lotus root is very creamy and naturally sweet when grated with a ceramic grater. 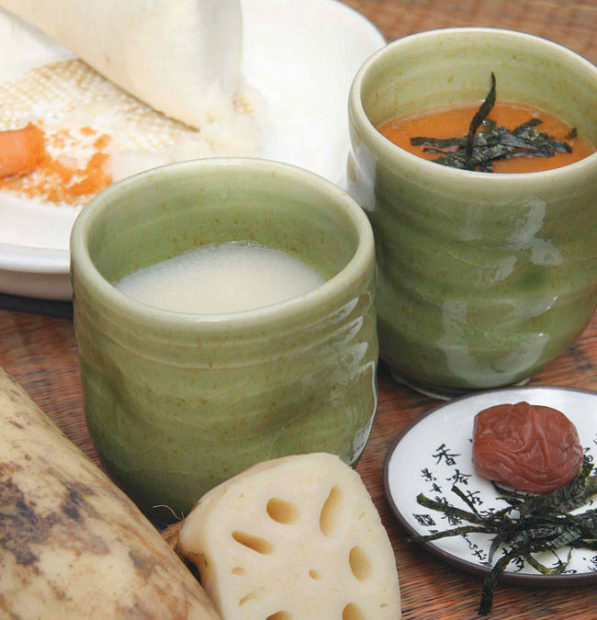 Carrot and Daikon Remedy helps detox your body, especially the intestine, from excessive consumption of animal- or plant-based protein, fat, oil, and salt. Place the grated lotus pulp in a piece of cheesecloth and squeeze out the juice into a measuring cup. The amount of juice you get will vary depending on the quality and freshness of the lotus. 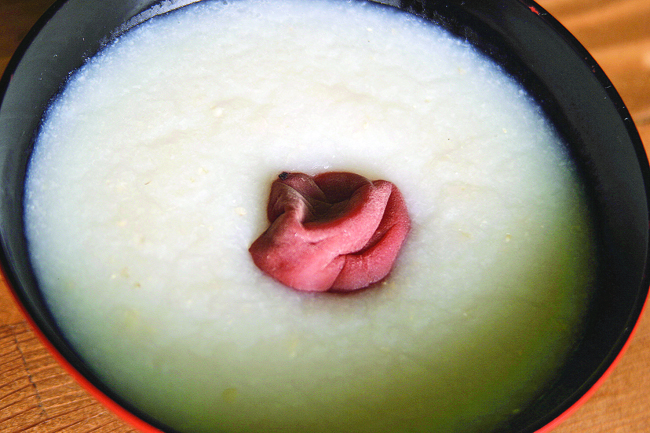 The pulp may be saved and added to other dishes, like miso soup. In a small saucepan over a medium-high flame, combine the juice with an equal amount of the purified water. Add a pinch of sea salt or a few drops of soy sauce. Bring juice mixture to aboil, reduce heat to low and simmer for 2 to 3 minutes. The tea should be thick and creamy. 1. In a small saucepan over a medium-high flame, combine the grated daikon, carrots and purified water, and bring to a boil. 2. Addchoppedumeboshiandafewdropsofsoy sauce (if desired), reduce heat to low and simmer for 2 to 3 minutes. 3. Transfer into a serving cup, add shredded nori, and drink hot. Recipes are from Love, Sanae cookbook. I have been practicing macrobiotics for more than 25 years, and remedy drinks are simply kind to our body and soul, yet very effective for cleansing. So, I make them almost every morning instead of coffee. Drink these remedy drinks at least 30 minutes before breakfast, or in the late afternoon between meals. Most conditions take at least two to three days of continued drinking. If you have a serious health condition, it’s always wise to consult with an experienced macrobiotics counselor. You can contact me here or check counseling service for counseling. My oncologist, Dr. Mead, said I am doing well after the chemotherapy, so she suggested that I meet with a liver specialist for hepatitis C, which was most likely the cause of the primary non-Hodgkin lymphoma of liver stage IV that I was diagnosed with last year. The hepatitis C came from a blood transfusion when I had a near-fatal car crash in 2001 and was in a coma for three days. Since I had ovarian cancer in 1993, I have learned to live carefully and practice macrobiotics and exercise. Still, I got hepatitis C, and that led to lymphoma. I was so shocked and disappointed when I was diagnosed. I really wanted to use holistic treatments and get better as I was able to do with ovarian cancer in 1993. But this lymphoma got so big so fast and took over 90% of my liver. I knew I was dying if I did not do something quickly. In order to save my life, I had no choice but to have chemotherapy this time. 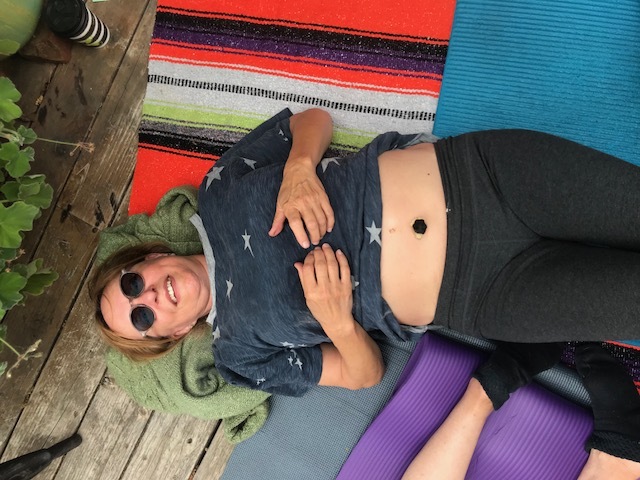 I felt it was a long and painful experience, but I committed to taking care of my health one day at a time (many times, one moment at time) and continue a macrobiotic diet with the lifestyle and holistic modalities of moxibustion, reiki, acupuncture, shiatsu massage, meditation, aromatherapy, Bach Flower Remedy, etc. I was able to complete chemotherapy without most of the side effects and am doing much better. I have been off chemotherapy for 10 months, and I am even able to go hiking again. 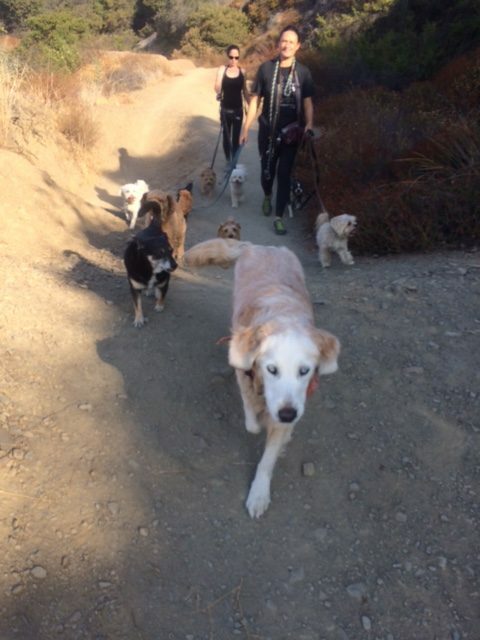 Hiking with dogs including my Lumi & Nalu! I went to meet a liver specialist, Dr. Han. He explained how hepatitis C could lead to lymphoma, and he highly recommended taking hepatitis C medication, which has a 97% success rate. Another medication in my body and soul? 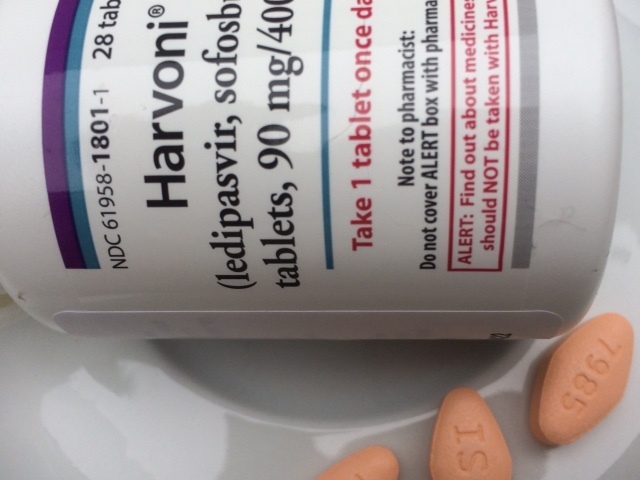 Hepatitis C medications sound very intense. Also, when I heard how expensive it was, I could not believe it. A 90-day supply is about $95,000. Including tests and doctor visits, the cost would be $100,000—and Medicare would not cover it all. They said I have to apply for Part D (Prescription Drug Coverage), but there is no guarantee they would accept me for coverage. UCLA Hospital’s patient assistance office, Dr. Han’s office, and more. I called and called and talked to many people so I could take care of this matter. This was before *Mercury’s retrograde (July 26), but I really felt that it was in the middle of it. I felt that nobody understood my accent or that my English was not good enough for anybody to understand. Frustrated, I struggled and even cried over this Medicare system. There is a site I checkd What To Do If You Can’t Afford Hep C Treatment? 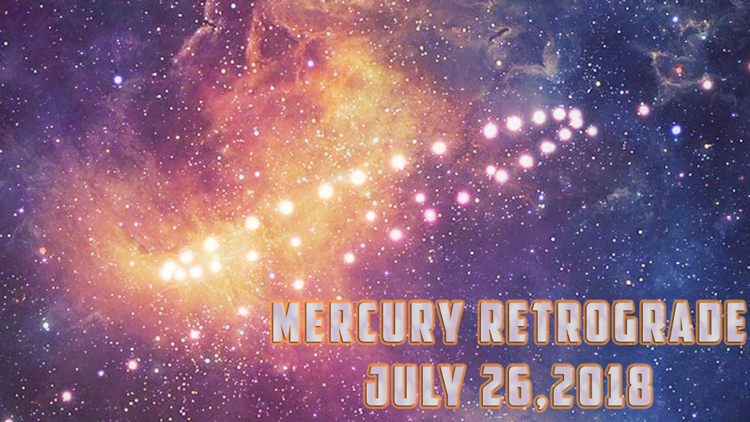 Photo from https://www.findyourfate.com/planets/mercuryretrograde-july2018.html You can find about Mercury’s retrograde! From Everything You Need to Know About Mercury Retrograde: Mercury retrograde periods would not be good times to do anything involving communications, such as launch a magazine, website, or an advertising or publicity campaign. I checked hepatitis C medication costs all over the world. They are so expensive everywhere—even Canada, Japan, and Mexico. I made my own decision, and I told my husband Eric that I probably do not need this medication. He said, “It’s up to you.” What a guy! He knows I am a very optimistic person, so I was not going to worry over this medication. I am so grateful that I did not get so attached to this issue and let go so I was not stressed out about it anymore. A few days later, I got a phone call from a woman at UCLA hospital. She told me there are pharmaceutical company programs to assist patients who can’t get the hepatitis C medication. It usually takes three to six months to get an answer, but I can apply and find out if I am eligible or not. Well, I believe in miracles, so I decided to apply; I had nothing to lose. I requested an application form, which came in a few days. I put together all my information and sent it to UCLA by email. I was so surprised that it was only two days after I’d applied. She said I was going to receive Harvoni, which I’d heard was the most expensive. She said, “It is prescribed by Dr. Han.” I asked why he chose it. When did they take a DNA test? I could not believe what I’d heard. The next thing I was shocked to hear was that the medication would be delivered next week by UPS. She said that since it is expensive, the hospital does not keep it in their pharmacy. Wow. They do not trust a hospital, but they trust UPS. I am really puzzled by this system. She said someone would call me before they shipped the medication the following week. I waited about three weeks, but nobody called, and nothing came. I thought maybe I had dreamed it all. Meanwhile, so many things happened from the end of June to the end of August. Eric got injured and was in pain for about seven weeks, so I had to go through emails from 60 different people who were interested in moving into the unit next to us. The unit used to be my cooking studio and the office of Seed Kitchen, so it was the first time in 10 years we’d rent it out to someone we did not know. I showed the unit to at least 30 people. I was exhausted and forgot all about the medication. Finally, we found the right people to move into the unit, and all of sudden I remembered that nobody had called me about the Harvoni medication. I made a phone call to Gilead and had to talk to two different people to find out what happened. They said they had a wrong phone number, so they never sent the medication. Wait a minute—they were the ones who’d called to tell me I got approved. What did they do with my phone number? On top of what had happened, getting the Harvoni by UPS was crazy. They said someone would have to sign for it because it is so expensive. so I could hear when the delivery person came to the gate. 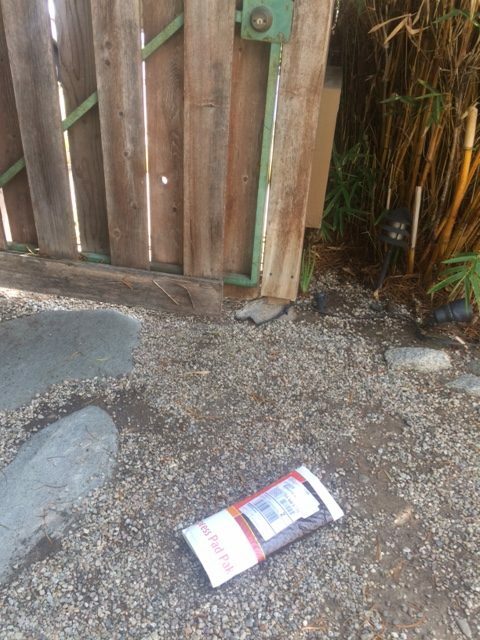 Many times, delivery people and postal workers do not come inside the gate because of the “Beware of Dog” sign we have. I waited about seven hours, and it was almost 4 pm. I was getting tired of waiting, so I called Gilead and got the tracking number to check the status online. It showed it was delivered at 12:29 pm and signed by Kari. I went to the front gate I found that $30,000 worth of mediation was left on the ground by the gate. But am I glad that I received it? It was one day before Mercury retrograde came, but it sure felt like it had come way ahead of time. because I was a perfect candidate, who’d had lymphoma cancer and was getting better, with an application that was all together. I know since I was accepted for this medication that I am supposed to take it. I have been taking it everyday. Thanks to my healthy macrobiotic life with remedy drinks that I drink every morning to detox this medication, no side effects! I look forward to seeing the results in November and let you know. 12 years ago, on August 15, I got a phone call from my sister that my mother passed. I was very shocked since it was sudden death from asthma attached and she could not breathe. I just came back from Kushi Institute for my teacher training and found out that my mother called and left her voice message, but it was accidentally erased before I could listen to it so I never knew what she said on the message so I was going to call my mother when I came back home, but before I called her my sister called for sad news. 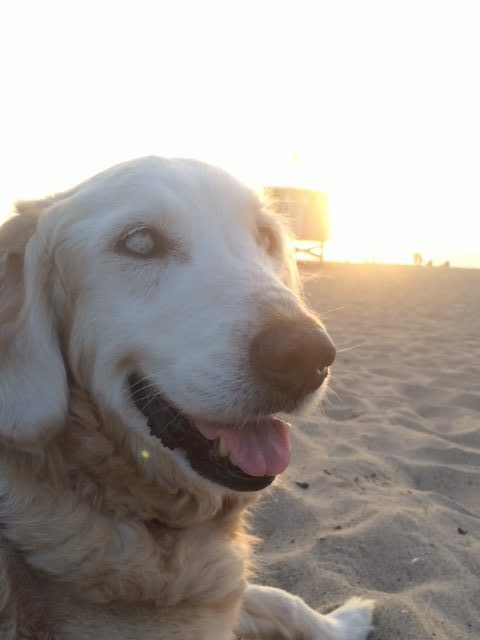 I scream as I heard this sad news and did not know what to feel, but hours later, on the same date, here in Santa Monica my first service, dog, Kin birthed healthy 7 puppies even she was almost 10 years old and Oro was the last one to born at my house. She really did not want to leave the house because everytime someone came to choose or pick up a puppy she hid. She played a ball as soon as her eyes opened. Oro (orange) with her first ball! I was grieving losing my mother, but Oro brought new life and gave me a purpose in my life once again. She is a special dog daughter just like my beloved dog daughter Kula (if any of you remember that I wrote about her on my blogs two years ago). 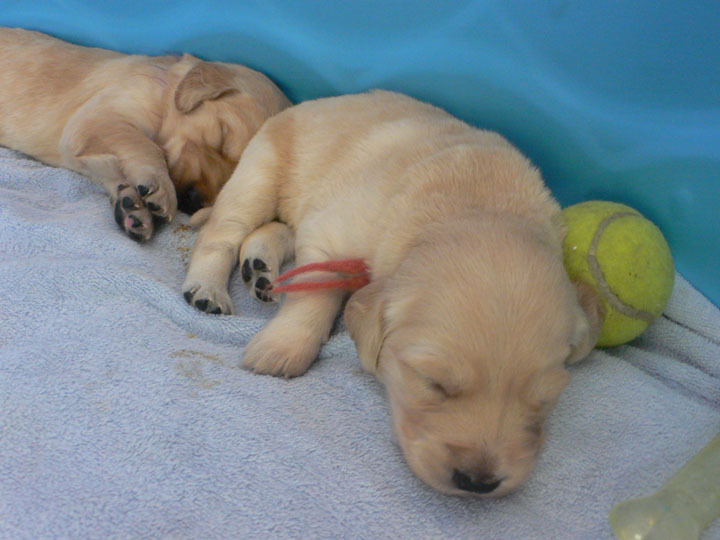 Oro is Kula’s half-sister, and she is also a service dog, just like Kula and their mother, Kin, who was my first service dog. 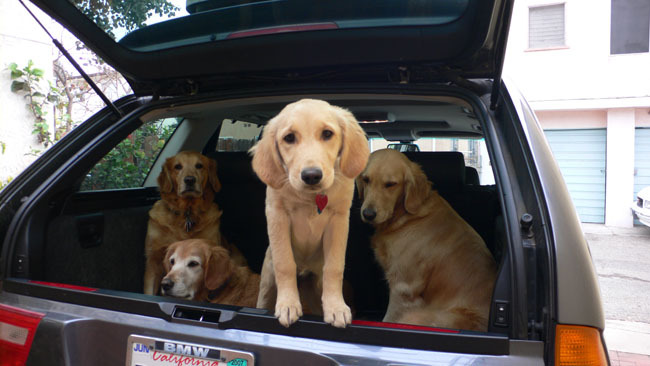 Oro is going to North Fork with Kin, Kula, and Dore. Oro was very connected to her mother, Kin. She lost her eye pigmentation a little by little when she was two years old, shortly after her mother Kin passed. We took her to eye specialist doctors, but they could not find a cause. She has mysterious white marble like eyes which to me are so special. She sees when there is no light, but in the daylight, she can’t see well, the way we need sunglasses in bright daylight. We bought two different sunglasses for her, but she did not like any of them. Oro with beautiful white marble eyes. Wherever we take her out, everyone loves and all other dogs love her too. She is very polite and kind. When we became a foster family for Leo from Golden Retriever rescue, he fell in love with Oro so we had to adopt him. They really care for each other and Leo even shares his food with Oro. Oro is a very smart dog so I took her to K9 Nose Work training when she turned 9 years old so she can use her brain. Although she was not quick to find an object, she was methodical so she won’t miss anything so the trainer was amazed by Oro’s ability even she can’t see well daylight. She did not know how to swim, so Eric had to teach her. She mastered it pretty quickly and came to love swimming. When we go to Manzanita lake in North Fork she never wants to leave until she is the last one by herself, and then she would realize that she has to leave. 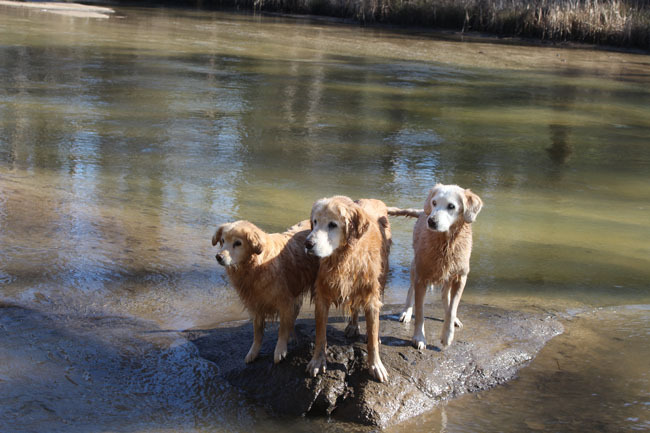 Oro, her boyfriend, Leo and her daughter, Lumi (right to left) at Manzanita Lake in North Fork, CA. She also loves to go hiking. 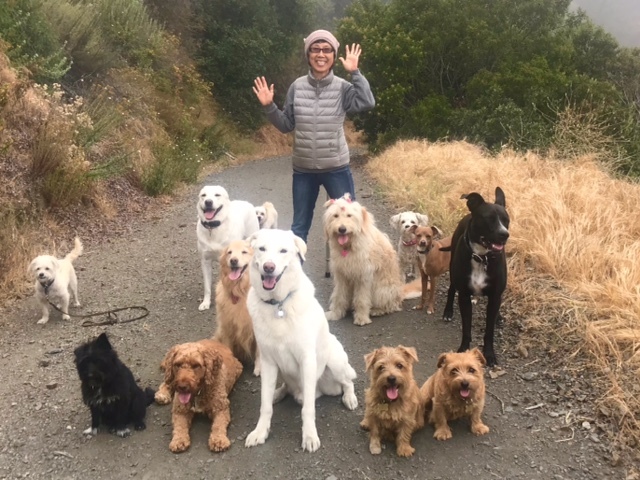 This year she joined one of the small dogs’ groups because she is so kind and nurturing to small dogs and she really had a great senior life. About one month and a half ago (July 12th), when I was cutting her nails (I cut my dogs’ nails once a month) and checked her body and was shocked to find a lump on her abdomen. She had had a blood test a month ago and everything was good so I was surprised, but I know that a blood test goes not show everything. Because of what I went through with Kula two years ago, who had spleen cancer (hemangiosarcoma) my mind blacked out, and I went to a place I did not want to go in that moment. Typical hemangiosarcoma signs are lethargy, fever, weight loss, fatigue, petechial hemorrhage (small bleeding points on the gums or skin), anemia, diarrhea, increased urination, frequent infections, easy bleeding, pain or fullness in the left upper abdomen that may spread to the left shoulder or leg, and feeling full without eating or after eating only a small amount from the enlarged spleen pressing on the stomach. It is a rapid growth of the tumor and may make the spleen rupture spontaneously, with acute collapse and breathing difficulty that is life-threatening. 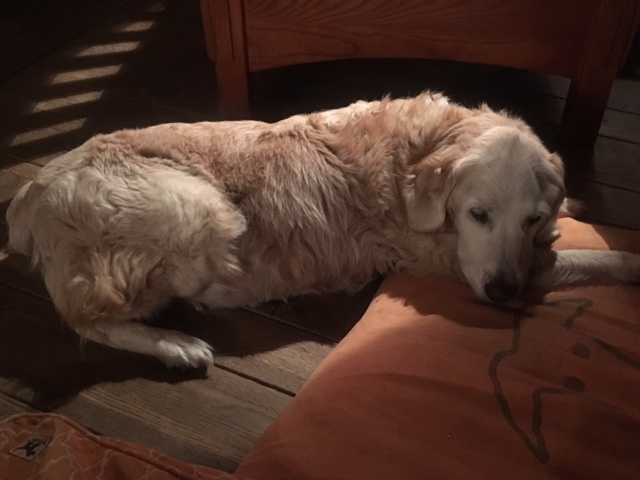 Oro has good energy and doesn’t tire easily, and she has not lost her weight. Fortunately, she has no fever or diarrhea, no abnormal urination, no anemia, etc. Kula, on the other hand, had lost weight, was tired, had a fever, and could not walk much because the tumor got big and pushed her hips. 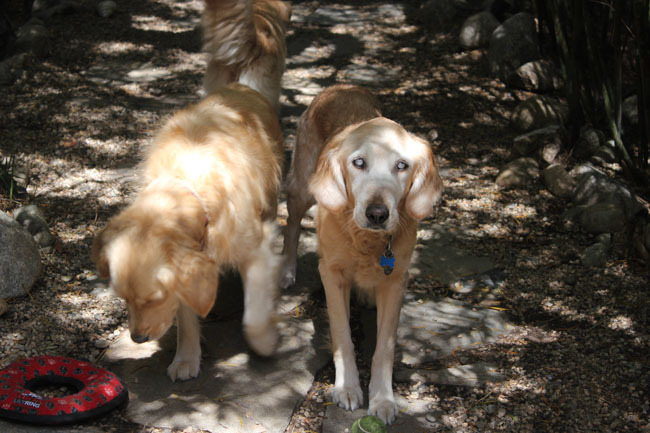 What I found out about hemangiosarcoma in dogs from experience with Kula. Hemangiosarcomas are fed by the blood vessels and fill with blood. Because of this, the tumor can rupture, leading to sudden and severe hemorrhage, collapse, and rapid death. 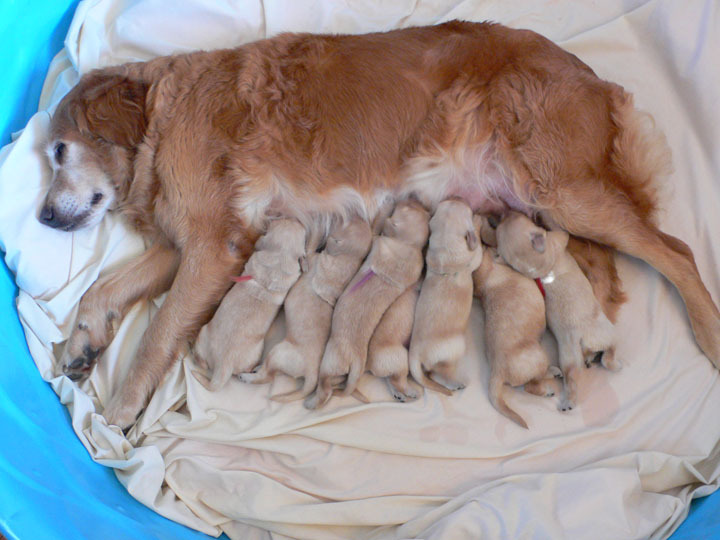 Often, owners do not realize their dog is affected by the sudden hemorrhage or collapse. It is very scary since it can happen so suddenly. But I told myself that Oro has so far not shown the symptoms associated with spleen cancer so she will be okay. The next day I brought her to the beach, which she loves the most. Watching her enjoy the beach so much, I prayed that she is okay. Oro at CVG before she was diagnosed with spleen cancer. The following week, Eric and I took her to see a veterinarian, who said it looks and feels like spleen cancer (hemangiosarcoma) so Oro needed to have an x-ray and ultrasound. She recommended me to take Oro to Veterinarian Cancer Group (VCG). She looks so healthy and energetic,” my inner voice cried out. But I found out that some dogs do not have any symptoms of hemangiosarcomas. We were able to get a VCG appointment next day on Sunday, and while we were waiting for the results of the x-ray and ultrasound, I knew that no matter what, I am committed and ready to help her the way I helped Kula every step of the way until she took her last breath. The VCG doctor confirmed that Oro has hemangiosarcoma which had already spread to the liver, so there was nothing they could do. 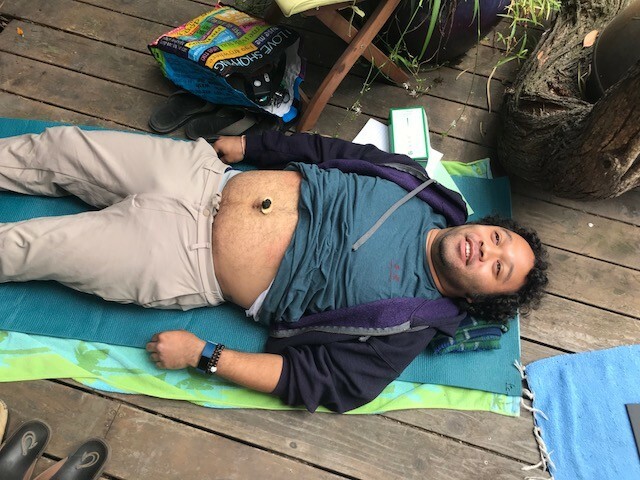 It will be lying if I said I have been there so I am not in a panic, but I feel I am all right and will continue to take care of myself, one day at a time, and sometimes one moment at a time, so that I can have the power and strength to take care of Oro. This summer is almost over…we really did not do much. Eric got injured and was not able to do much for 7 weeks. My new medication for Hepatitis C issue was ups and down since my insurance did not cover and it cost over $90,000 for three months, next door is under construction so I feel there is no peaceful moment at home, more and Oro’s cancer. It has been over one month since I found her lump on Oro’s abdomen. She had a blood leakage episode five times in the last three weeks. I am learning to live today might be the last day for Oro and be grateful and have gratitude each day! It is not easy, but I am doing my best. I did it for myself last summer when I was getting Lymphoma treatment. But Oro is a fighter! Last weekend on Sat. it took 9 hours for Oro to regain herself and yesterday Monday, it took 20 hours for her to regain her mobility. Oro is trying to rest after Reiki and Moxibustion in an aromatherapy diffuser room. Today, she is a little weak, but happy again and eating a full meal. I have been giving her Yunnan Baiyao Chinese medicine and other herbal blend medicine prescribed for Oro by Holistic veterinarian Dr. Lane. When an acute moment came I used Yunnan Baiyao emergency small pills to stop the bleeding. I did not know how to use it when I started to use it for Kula so I have learned some since then so I am grateful that Oro has overcome five times so far. I told her that her birthday was coming. We went to celebrate her birthday on the beach for sunset. 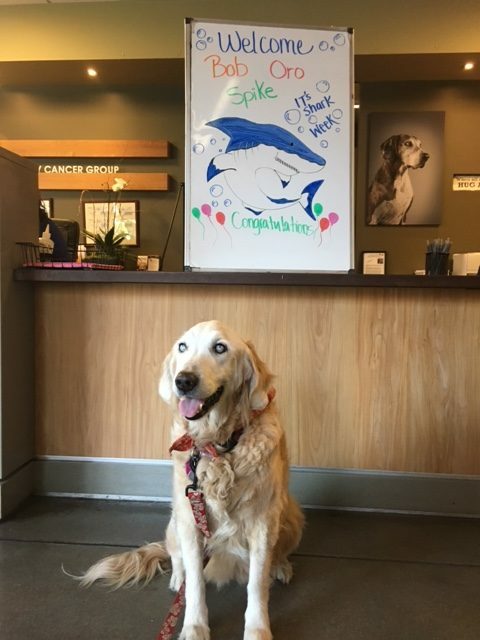 She met many people and dogs and greeted everyone so I told them it was her birthday. Birthday special sunset beach to celebrate Oro’s birthday and my mother’s 12 years memorial! 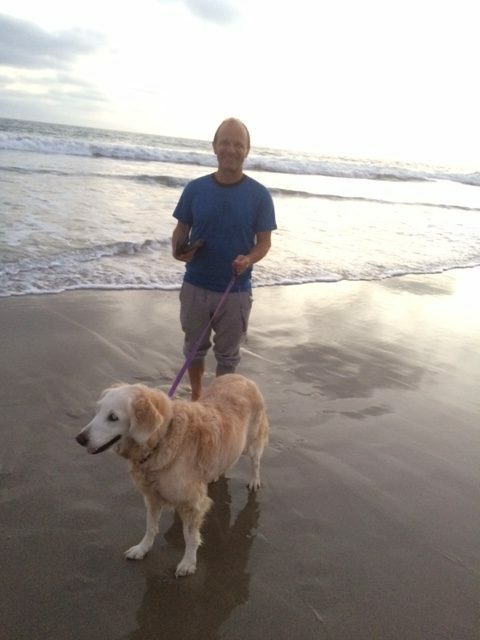 Eric and Oro for Oro’s birthday beach walk! I want to help her as much as she wants to live so I am spending my time with precious Oro by talking (I have been learning Animal communication with Lydia Hiby), making special healing food, giving her Reiki, Moxibustion, gentle shiatsu massage (Healthy Happy Pooch book shows dog meridian points), also I made her personally Bach flower remedy so she does not have to worry so much. I am so grateful to be Oro’s human mommy! I thank Oro so much that she came to my life! 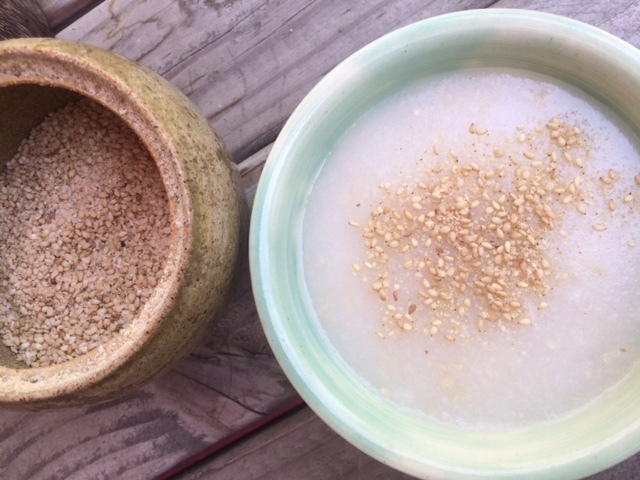 The first time I made Brown rice cream was when my mother was very ill and couldn’t eat much of anything. Later, she remarked how warm and better she felt inside. To me, this experience exemplified what I believe “true healing” is all about. When I started chemotherapy for Primary Liver Diffuse Large B-cell Non-Hodgkin Lymphoma (caused by Hepatitis C that I got from the blood transfusion when I had a life-threatening car crash in 2001) last year, I had no idea the side effects included a change in my taste buds. During chemotherapy, I was not able to eat many of my favorite foods, including miso soup, leafy greens, sea vegetables like hijiki and arame, soy sauce, umeboshi plum seasoning, etc. I was very weak, and not only was I not able to eat anything, I could not digest the food, so Eric made soft rice porridge. One day I remembered how much Brown rice cream helped my mother, so I asked Eric to make it for me. This was the best thing I could have asked for! 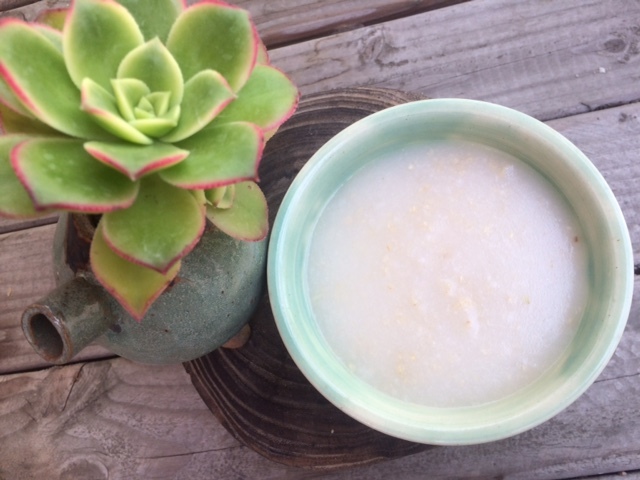 Homemade brown rice cream is very digestible, and when I put it in my mouth in the hospital room during my first chemotherapy, I felt that the warmth and creaminess of brown rice cream gave me comfort deep inside. My feeling of tightness out of fear and sadness were lifted away. Homemade brown rice cream is, on top of these benefits, is very nutritious for special healing. I have been eating it for breakfast every day for over one year. I love the soft gentle texture, which makes me feel calm and at peace. My mother was right. I feel warm and better each day. Hope you try it someday! Wash and soak the brown rice for over six hours to overnight. When soaking is completed, transfer the rice to a cast-iron or stainless steel frying pan over medium-low heat. Using a wooden spatula, dry roast the rice until it is uniformly golden brown and the rice releases a nutty fragrance. In a stainless steel or ceramic pot, combine the toasted rice and the water over a medium-high flame until the water begins to boil. Add sea salt, and cover with lid. Place a flame deflector over the flame, reduce heat to low and simmer for 1 1⁄2 to 2 hours, or until half the water has evaporated. Wait an additional 5 to 10 minutes, remove the lid, and allow to cool. Transfer rice to an unbleached cheesecloth or a very fine mesh stainless strainer (food mill) that is placed over a bowl. Squeeze or mash the rice cream to separate it from the pulp. Transfer the cream back into the pot over a medium flame to reheat. * Condiments: Varieties are gomashio (sesame salt), an umeboshi plum, scallions, chopped parsley, sunflower seeds, or pumpkin seeds etc. There are many holistic (healing) modalities we can use to regain and keep our health. I can think of all the holistic modalities I have used before and now: acupuncture, moxibustion, craniosacral therapy, massage (shiatsu, anma, etc), physical therapy, qigong, t’ai chi, yoga, dance therapy, art and color therapy, lymphatic therapy, herbal therapy, aromatherapy, Bach flower therapy, hydrotherapy, nutritional counseling (macrobiotics), reiki, power crystal stone, hypnotherapy, meditation. There might be more, but you get an idea of what I have done. Some of them, I really enjoyed learning and receiving health by practicing daily, so I decided to go to school to learn and become a practitioner. My not-so-secret of healthy practice is eating whole-grain, plant-based foods seasonally and according to my physical, mental, and emotional conditions. Also, I do yoga, meditation, and other healing modalities to tune myself up. 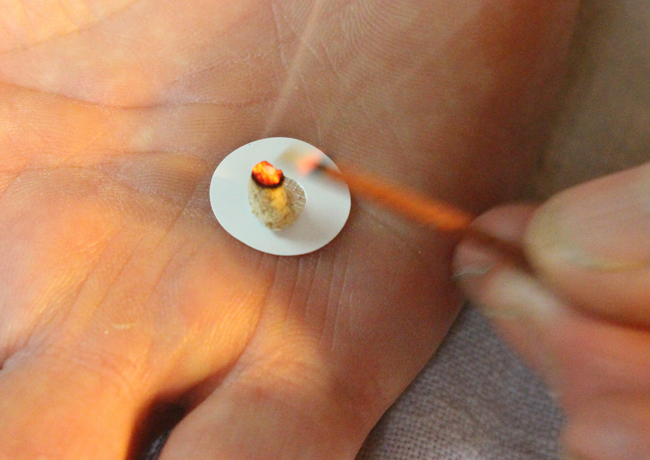 Today, I want to share about moxibustion (moxa), which may not be well known in the US yet, like acupuncture. I love moxa because we can receive many benefits from it. We can apply moxa to ourselves—it is not difficult to learn how to use and apply—and of course, you can help others. It was perfect for me since I do not like needles, so learning acupuncture was not my practice. I learned about moxa the first time when I was a child when my father was receiving anma massage and moxibustion at home from an anma practitioner, Mr. Yamauchi. He was almost blind, but he rode his bicycle to our house after 10 pm, before my father went to bed. I liked to receive anma massage from Mr. Yamauchi sometimes while he was waiting for my father to finish his bath, but I really was curious about moxibustion, since it was kind of a mysterious modality to me. It had a distinctive smell with smoke because you light it up with fire or incense. I loved the smell and the smoke somehow; I think it was Japanese aromatherapy, hahaha! Massage and moxa combinations were excellent to relax the body and mind. When I received a little massage from Mr. Yamashita, even if I did not receive moxibustion, I was already relaxed from the smell and smoke. When I had ovarian cancer in 1993, I used moxa, but I was too weak and had too much pain, so I could not apply my own. I received it whenever my husband, Eric, was able to apply it for me. I felt better, and it eased the pain. I also have used moxa whenever I need to release pain (neck, back, shoulder, legs, etc.) or for overall health and energy. I found a moxa stick holder about 10 years ago, so even if I am weak or have pain, I am able to apply it on my own (of course, it is nicer to receive from someone else, especially on my back). Since last year, I have been using moxa again everyday to ease the liver pain for Primary Liver Non-Hodgkin of Diffuse Large B-Cell Lymphoma (DLBCL). It also relaxes me, and I am able to rest or take a nap. so I decided to offer an introductory workshop class last Saturday. 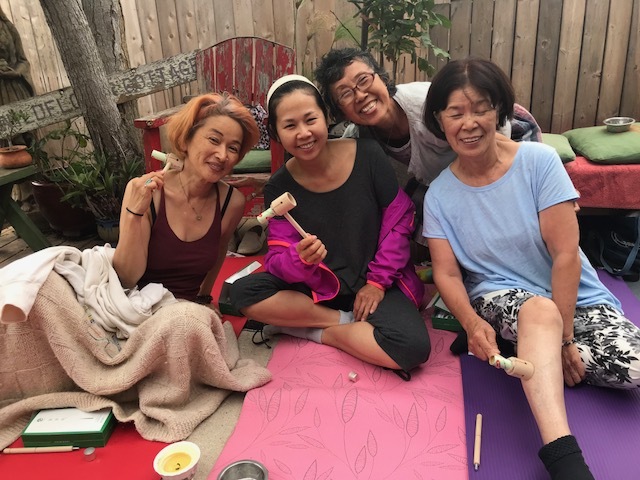 The class reached capacity right away, and already a few other people have asked to come when I offer the next one—so I do plan to offer another moxibustion workshop. If you want to attend, email me at sanaehealing@gmail.com. 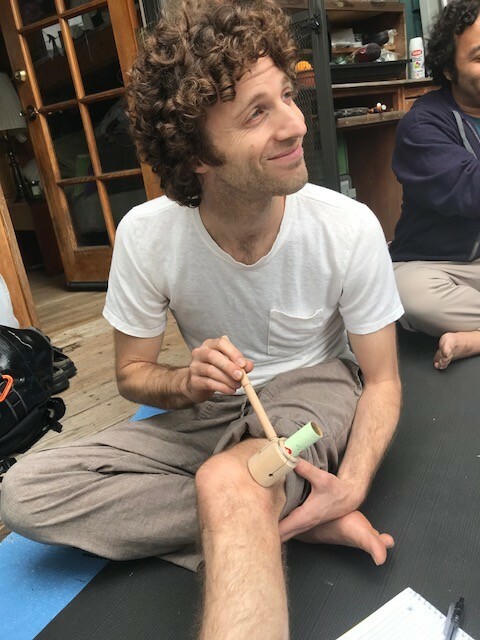 Jay is applying a stick moxa with the holder over where he injured. Moxa girls (from left, Kanako, Masako, Me and Masano) are using stick moxa with the stick holders! Moxa on a ginger slice to help ease Masano’s back pain. Brandon is applying moxa on a sliced ginger just above his navel for digestive systems and overall qi energy. Vladka is applying moxa on the slice of ginger below her navel for stress, back pain etc. 2) How does moxibustion benefit our health? 3) How do you use moxa (moxa types)? 4) Which meridian points get benefits with moxibustion? 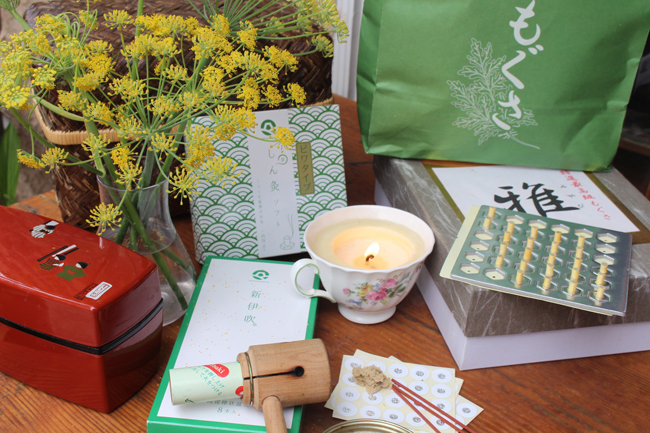 5) What are important things to do after moxibustion? 6) Are there any side effects from moxibustion? 7) Practice, practice, and practice! Moxibustion is started in China about 3000 years ago. Then, Japanese envoy to Sui Dynasty China and Japanese envoy to Tang Dynasty China brought to Japan. It is one of historical holistic home healing modalities, which has been written, in classic literature and Haiku. Moxibustion is a form of heat therapy in which dried plant materials called “moxa” are burned on, or very near, the surface of the skin. The intention is to warm and invigorate the flow of qi in the body and dispel certain pathogenic influences. 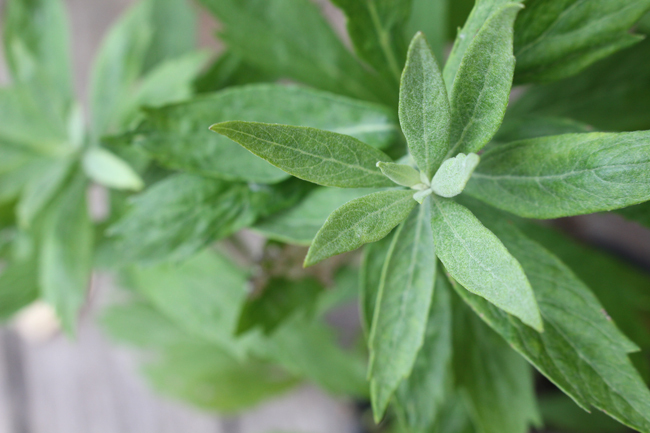 The moxa I use is usually made from the dried, leafy herbs of Chinese or Japanese “mugwort” (Artemisia argyi or Artemisia vulgaris). How does moxibustion benefit our health? 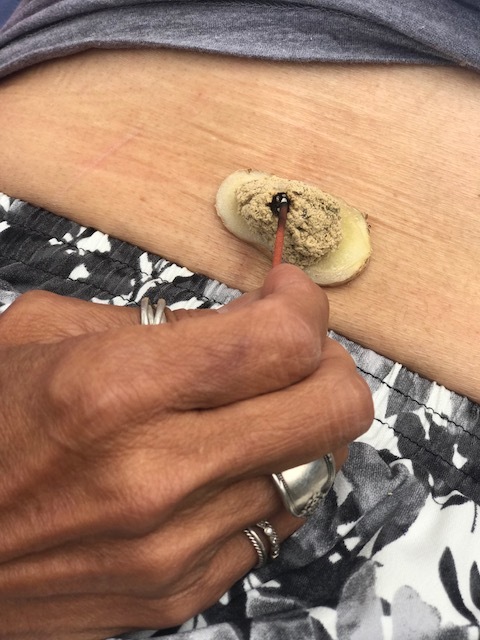 Moxibustion helps with circulation, immunity, and lymph flow. It’s good for colds, the flu, and fever; pain in the eye, head, neck, shoulder, or back; sensitivity to cold; indigestion, constipation, and diarrhea; insomnia, swelling, palpitation, emotional instability, and stress; and liver, kidney, and other organ support. It gives energy and relaxes at the same time. If you are interested in purchasing premium-quality moxa, sticks, holders etc., please email sanaehealing@gmail.com. I wrote this blog last September. It took time for me to be ready to share. Now I am ready to post. You will know why it took time for me to be ready after you read. Before I announced that I was diagnosed with Primary Liver Non-Hodgkin of Diffuse Large B-Cell Lymphoma (DLBCL) I was concerned what other people would think of me. When I was really sick from ovarian cancer 25 years ago and started macrobiotic and holistic approaches and nobody really wanted to talk to me about how I was trying to get better. At that time macrobiotics and holistic healing were not so well known to most people, so my decision to not to have chemotherapy and follow only the holistic way was frightening to many people around me. But after a year or so when I started to heal myself and look healthier, people started to ask me how I did it. I did not realize how much I was able to help other people with my story and I learned a lot about sharing it too. 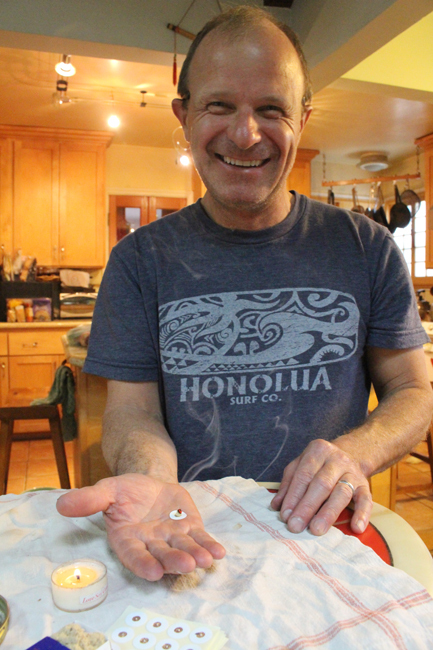 I did not plan to be a macrobiotic counselor, cooking teacher or educator, but it just came to me as I shared my story. Of course, I decided to go to school to learn more macrobiotic, natural healing and alternative medicine and went on to receive certificates and to practice everyday and it became my life. Through practicing macrobiotics and living a natural life, it became my career naturally. My first cooking class was at Erewhon natural foods market in 1995. I was so happy to share what I had learned through ovarian cancer through my first teacher Cecile Levin and then Michio and Aveline Kushi. I realized that being a macrobiotic teacher required knowledge and commitment, and more importantly teaching by example. 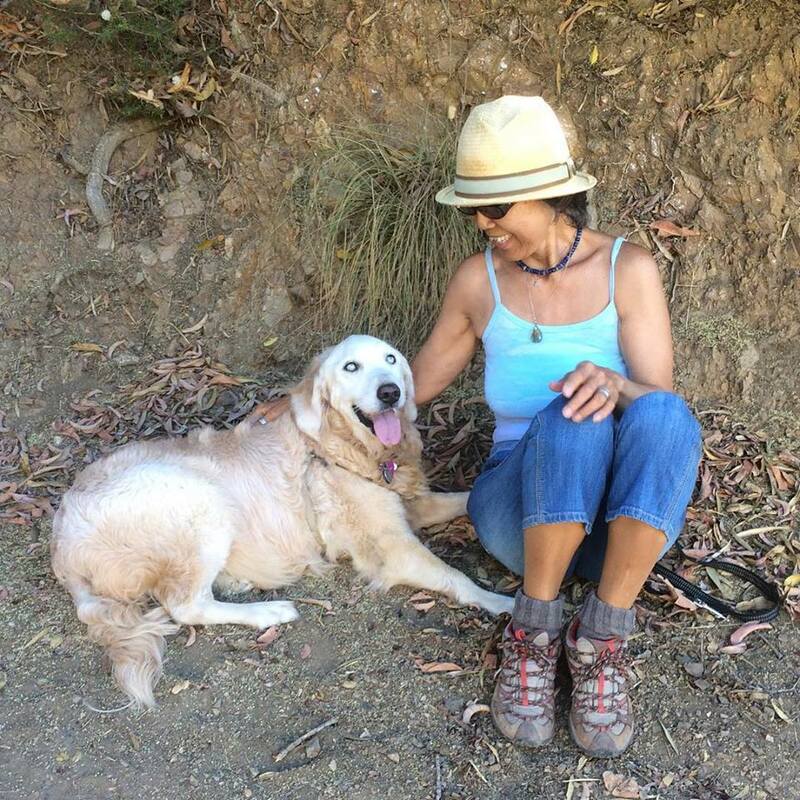 I continued to share my story and macrobiotic life with my husband and furry family. I realized that there was a reputation connected to being a macrobiotic teacher. 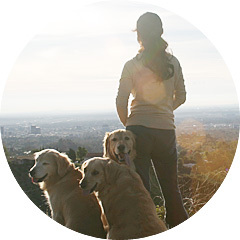 I felt that reputation matched my good health and happy lifestyle with my family (Eric, dogs, and cats). I received a letter from a macrobiotic acquaintance who has been active in the community for a long time. It was painful to read her judgments and misunderstandings about my condition. She questioned my relationship with macrobiotics and clearly hadn’t read the details on my blog. 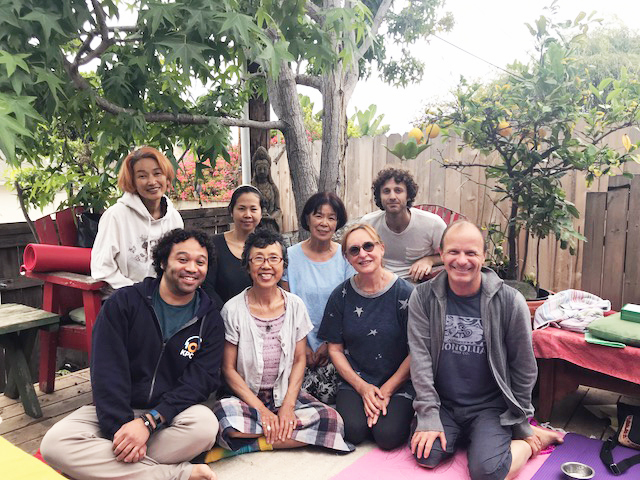 I understand her position; whenever a macrobiotic teacher experiences illness, it can send a wave of fear through the community. It is human to experience that fear (of death, or of one’s own potential suffering), but it’s equally human to not want to feel it, so we throw it back on the person who is sick. Of course, most people don’t respond like this, and I have been met with an extraordinary amount of compassion on this recent journey, but being faced with judgment and a questioning my practice was one of my biggest fears when revealing my condition to the healing community. For the record, I have never veered from my macrobiotic practice. If I had, ovarian cancer would not have stayed in remission for 24 years. I am not strict like I had to be to recover the first time, but I also don’t “play” widely. Eric and I cook almost every single one of the meals that we eat. We even cook for our dogs! I contracted Hepatitis C sixteen years ago from a blood transfusion I needed in order to survive a catastrophic car accident. I was powerless over that–I received the transfusion while I was in a coma. Hepatitis C can flip into large B-cell lymphoma in the liver. The lymphoma in the liver was growing so fast, and the diet and other holistic approaches were not saving my life fast enough. Receiving the diagnosis to live only weeks. 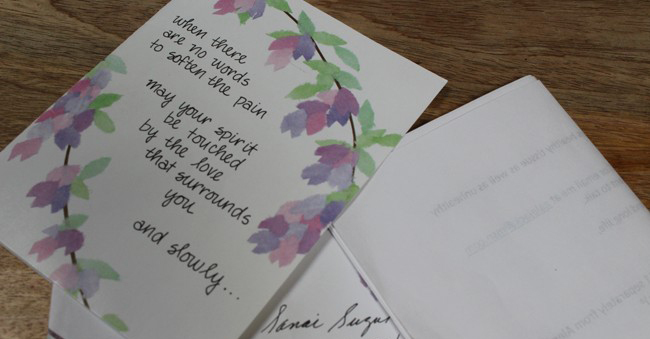 I am grateful to be alive, even to receive difficult letters. And the lovely food I have the privilege of eating—the whole grains, the vegetables, the beans—give me the energy to send love to my macrobiotic acquaintance. The person who wrote me might have disapproved and been disappointed that I did not just do macrobiotics. But I am living for me, not for this person. I also know a quite few macrobiotic people and teachers who actually lost their lives because they did not seek and/or believe in western medicine. I learned to believe chemo medicine is there to help me and I wanted to make sure the chemo medicine could hear me so I had to communicate with it. I know chemotherapy could destroy my healthy tissue and organs, but I am a macrobiotic person so I will not let chemo destroy me and if my healthy tissue and organs get weak or damaged in order for cancer to leave my body I will heal my tissue and organs and overcome it no matter what! it actually has helped me to thrive and motivated me to move forward to prove that the macrobiotics I have been practicing will work for me and will help many many more people in the future in the way that’s best, and everybody’s best is different. I have been judgmental too, in the past, but I am learning to let go of it. By going through the chemo, and all the feelings it kicks up, and having to be dependent on the kindness of others, my judgment has lessened and my compassion has grown. And so has my gratitude. I am ready to go to the third cycle of chemotherapy to save my life. P.S. After this letter, I found out some of my students don’t want to talk to me because I took chemotherapy to heal myself. I have been teaching macrobiotics and holistic modality since 1995 and offering my macrobiotic nutrition counseling, but I never told anyone to not get conventional treatments, including chemotherapy. Macrobiotics and holistic approach work usually for chronic conditions, not for acute conditions, and I believe meeting in the middle to use both benefits, if necessary. I have learned when I started to live in the U.S. “What other people think of me is none of my business” so I Prayed for them.